The elegance and passion of Spain’s dance, music and culture is showcased in the 36th American Spanish Dance and Music Festival, Thursday, June 14 through Sunday, June 24. 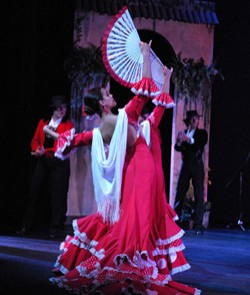 Each year this popular Festival attracts thousands of cultural fans from around the world to experience “Spain in America” with the Ensemble Español Spanish Dance Theater’s full company and guest artists from Spain. The Festival culminates with three crowd-pleasing “Flamenco Passion” live music and dance performances featuring world premieres (titles will be announced at a later date) at the North Shore Center for the Performing Arts in Skokie, 9501 Skokie Blvd., Friday, June 22 and Saturday June 23 at 7:30 p.m., and Sunday, June 24 at 3 p.m. Tickets are $26-$46. Free parking is available. For tickets, call 847-673-6300 or visit northshorecenter.org.